Where to log in: http://learn.unm.edu. UNM Learn Training Schedule: Open labs to help you become familiar with Learn and virtual sessions to help with migration. Welcome to Learn, a next generation learning management system (LMS), the platform being used by faculty and staff at the University of New Mexico for fully online, hybrid and web-enhanced courses. Request a course in UNM Learn: Follow the directions Web-enhance Your Course. Copy a previous UNM Learn course: Follow the directions Copy your Course. Combine sections into one Learn course: submit a section group request. Hybrid and Branch campus online courses: These courses should appear in UNM Learn automatically If there is a problem, please contact UNM Learn Support at learn@unm.edu and include the subject, course number, and section number. Main campus fully online courses: Please work with your assigned course designer for further information. When you first open your Learn course, you will have some links already in place to help you get started. The philosophy behind Learn is to build from the Course Menu: Create content areas (like Course Information) or modules from the Course Menu, then place links to files and course tools on those pages. With a little help from the resources below, you can customize the course to suit your syllabus and your teaching style. Adding content to your UNM Learn shell is an additive process. Your course will come with some links already in the course menu: see "Starting from Scratch"
Please be aware of what course you are entering. You will see all original (child) section courses in addition to the Section Group (parent/master) course. Please hide the child courses from your course list and do all of your work in the parent course. Your new Learn course shell comes to you with several links and an empty content area, Course Information. You start with a shell, then add publisher content first, then copy in content from your previous courses, and/ or add new materials, etc. Add tools to the menu or to content areas where you need them. 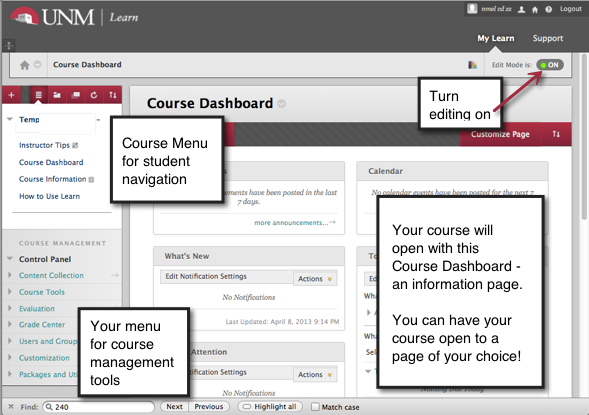 The default entry point for your course out of the box is the "Course Dashboard". If you remove or hide that page, the entry point will change to the next visible page. If there is nothing on the Course Information page, it will be hidden. The next visible page will be How to Use Learn, which is an external link (to documentation); it will cause the course menu to be hidden from you. **To avoid this problem, you must add some content somewhere in the course before choosing a new default entry point. For example, from the course menu along the left, click Course Information. From the red block at the top, Click Build> Add file (e.g. a sample syllabus or course schedule). Go to Course Management > Customization > Teaching Style and choose the entry point from the menu. Test what the students see with the Student View button in the upper right corner. Course Dashboard: a dynamic page of modules to help you and your students keep apprised of announcements, new additions, due dates and student progress. Some instructors will want to use this as the entry point for the course; you can have any page be the entry point! Course Information: this is a link to a Content Area, a blank page for you to add links to anything you like (files like Word docs or PDFs, weblinks, YouTube videos); our intention is to give you at least one place to add your syllabus, schedule, or other information about your course. To add more Content Areas, see Adding a New Content Area... below. How to Use Learn: Designed for your students, this is a web link to pages that explain how to use all the basic tools in Learn, and how to get technical support. All of the tools for managing your course are in this part of the left menu – for instructor eyes only. The Support Tab contains links to Learn Support pages, who to contact for direct help, and a link to LoboAchieve. The Global Navigation Menu is a tool to show these details at a glance - for students and instructors: calendar, new announcements, new discussion postings and grades (for students). Course messages will not appear here. Note: if you click that button from within a course, you will be booted out; hit your back button to get to My Learn. The Global Navigation Menu is a tool to show these details at a glance - for students and instructors: calendar, new announcements, new discussion postings and grades (for students). Course messages will not appear here. One thing to note: if you click that button from within a course, you will be exited from the course; hit your back back to get to My Learn. Browse for your file on your computer (and change the name that appears if you like). To move links within the course menu, hold your mouse down on the left of the element you are moving and drag up or down.